I love your blog. Coincidentally, I was just wondering why 7 is considered special! I never really noticed the sevan was a lonely number but than I relised it is by watching this video. I find that video very interesting because its like the sevan seas or the 7 dwarfs. Hi Sammy! Thanks for your comment! I agree that it’s interesting that 7 turns up in many places. Maybe that makes 7 not so lonely after all, with all those seas and dwarfs to keep it company. i learned that the number seven is a special and a loner out of the others. I also learned that there are seven planets but that’s just a coincidence. After watching the video I noticed that 7 is actually a really common number. I think that it is so cool that 7 is a lonely number. And I realized that 7 is the only one of all the numbers from 1 to 10 that is not divisible or not a multiple of ANYTHING. That is so cool! This video showed a lot of reasons why 7 could be a special number. He made that believable by showing 7 is not divisible or can be doubled. This was a great video and i really liked how he explained clearly. Seven (7) is also my favorite number and I cannot even explain why, but after watching this video, it suddenly made sense. I am also intrigued that finally there is a woman who won the Fields medal. I haven’t really thought about why people think number seven is a lucky number. I just thought it was superstition just like people say that thirteen is a number that brings bad luck. After watching this video though I have to agree that seven is a special and unique number. I never thought about seven being the loner. I just realized that noticing how coincidences there are. Like, the seven seas, the seven dwarfs, and the seven planets of course! Also, I just realized that 7 cannot be divided by the numbers 1-10! After watching this video, I agree that seven is special and unique I its own way! Love this video. It is interesting to use as a way to engage students in numbers, or math. The video is a great summary of how favorite numbers are connected with our live. I thought this video was very interesting.The number seven. Who knew seven would be used for many things without me even know it! It’s a loner meaning it is not related to any smaller numbers than itself. It can be used to catch criminals. It even stands out as the seven sins, the seven seas, the seven sisters, and the seven dwarfs! Whoa! I wonder if there is any other number that stands out just like seven. I hope you make another video and/or article. I figured if you add 12 to 7, you get 19, another lonely number. And if you add 12 to 19 you get 31, also another lonely number. I kept adding 12 getting more lonely numbers. The number seven is very interesting thanks thanks to you. Now I know the it’s related to the 7 dwarfs, the 7 seas, and the seven sins! I hope you make another article on a loner number like 17 and 19. Hi, Angel! Thanks for the comment. What do you like about 17 and 19? I’d definitely be interested in featuring them in an article. Let me know if there’s anything about them that you’d like to see! I never really took the number seven in consideration how special and different it is to all the other numbers . till know i can tell my friends and my family that i learned something new and ask if they had any idea that the number seven was unique . From this video , i now have a lucky and favorite number that would be seven. Thank you for making me look and think differently about my lucky number seven! I never really cared about numbers so i never noticed any of this. 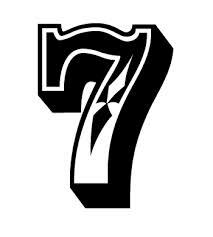 i think that is really cool that seven is a unique number I am happy because that is my number in baseball. so do that me special to? I think it does, Joshua! Thanks for the great comment. I wounder why seven is a loner.Maybe if there were different rules for math that involve seven it wouldn’t be so lonely. Hi, Luisa! That’s a really interesting idea. What kinds of rules for math would make 7 feel more included? And would they make other numbers feel left out instead?? Your comment definitely gives me a lot to think about. Thanks for sharing! who knew number 7 is a lot of peoples favorite number . Dear,Alex Bellos what made you want to research about the number seven. Also i wanted to ask what goal do you want to complete as a mathematician? I like the number seven for a lot of reasons the reason I like it the most is because I was born on the seventh but I liked your video. I enjoyed his explanation on why 7 is unique. I wonder if there’s more to it than just it’s inability to be divided by anything on the basic number scale. I think it is very interesting how it’s closest whole number companion is over 10. The only other odd number above 5 is a square and 5 itself is the middle man. The final idea I have is that the general shape of 7 in any font is appealing to the brain in some way. The idea for 7 isn’t bad, but who else would do that, and it’s coincidentally the only prime number between 5 and 10, so thats really not showing much. He might be right with the hands but not with the odd divisors. It’s interesting when you think about 7 this way but I don’t think this even occurs to most people when choosing their favorite number. It’s also strange that one number has all these special things about it.